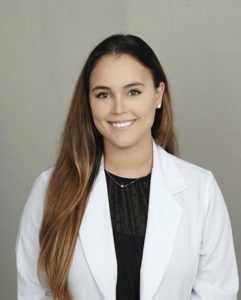 An advanced registered nurse practitioner, Jordan Rogers was born in Atlanta and raised in Ormond Beach, Florida. When she was a child, her father was diagnosed with skin cancer. Jordan developed an interest in dermatological nursing after witnessing a compassionate interaction between her father and a nurse. Jordan Rogers worked in cardiovascular care and with Alzheimer’s and dementia patients, before obtaining her Master’s of Science in Nursing from Georgia’s South University. She graduated with honors in 2017 and was invited to join the Sigma Theta Honors Society for Nursing. She is board certified by the American Nurses Credentialing Center and is a member of the American Association of Nurse Practitioners and the Dermatology Nurses Association. She enjoys traveling and spending time with her family, husband, and golden retriever. If she isn’t in the office, she is probably playing soccer or tennis, watching Florida State football, or deep-sea fishing.